As you may have read on our Facebook page, we're currently exploring the possibility of porting LCARS 47 to Mac OS X and above. There's no major news on the front, but we thought we'd let you all know what we're up to and why Drydock is a bit behind schedule. 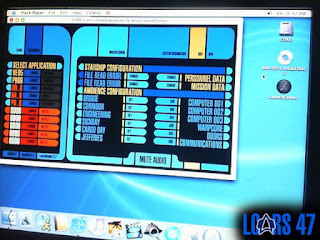 We should have a beta of LCARS 47 for Mac available soon. Until then here's a photo of the LaunchCenter running on Mac OS X—we had to take a photo because Stefan's Mac had no Internet and no USB ports.